May 12th marks the passing of visionary artist H. R. Giger, renowned for his groundbreaking design of the titular creatures from the Alien franchise. As a fan of both Giger's work and the Alien series, today's Pop Creature article is dedicated to bringing these horrifying creatures into the Pathfinder system. Many others before have tried their hand at adapting these monsters to tabletop games, but this article is more about commemorating a beloved creator than breaking new ground. Let us know what you think about the xenomorph in the comments section! A xenomorph is an endoparasitoid species that uses other creatures to gestate its young and modify its own genetic makeup. They exist easily in harsh environments, bleed highly corrosive acid, and have remarkable intelligence. Acid Blood (Ex): A xenomorph's blood is a highly caustic acid. When a xenomoprph takes damage from a slashing or piercing weapon it deals 1 point of acid damage to all adjacent creatures. Manufactured slashing or piercing weapons that damage a xenomorph suffer an automatic 1d6 points of acid damage for 3 rounds or until destroyed. Creatures with natural weapons suffer 1d6 points of acid damage for 3 rounds on dealing slashing or piercing damage to a xenomorph. Blindsight: All xenomorphs have blindsight 60' or greater. Death Throes (Ex): When a xenomorph dies it exudes a pool of its acidic blood in the space it occupies. This pool inflicts 5d6 points of acid damage for 3 rounds on any creature entering that square (a successful Reflex save reduces that damage by half). This acid can potentially melt through entire floors, leaving a 5 foot by 5 foot hole where the xenomorph's corpse was. The save DC for this ability is Constitution-based. Environmental Adaptability (Ex): Xenomorphs can survive in harsh environments with ease as if under the effect of a constant endure elements spell. Hive Mind (Ex): Xenomorphs have no language of their own, and instead communicate simple concepts via pheromone discharge and body language that other creatures with the xenomorph subtype understand. This ability functions within line of sight. 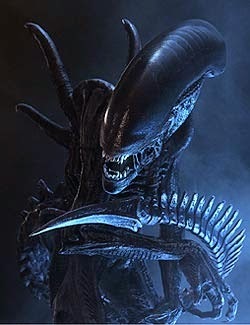 If one xenomorph is able to act in the surprise round of combat, all other xenomorphs in line of sight may also act. Secondary Jaws (Ex): When a xenomorph hits with its bite attack, it may make a second bite attack as a free action against the same target. Sightless: A xenomorph is blind and is not affected by any effect that relies on sight, such as gaze attacks or blindness. This creature is vaguely humanoid in shape, though its body is covered with a black, chitinous plating. Iead is grotesquely elongated, fingers end in wicked claws, and a bladed tail lashes back and forth. Even with its hunched posture, this black-armored creature stands at an imposing height. Its eyeless head is covered with an armored, chitinous hood and a long tail ending in a wicked spike flicks from side to side. Speed 50 ft.; Climb 40 ft.
Impaling Sting (Ex) When a xenomorph queen inflicts a critical hit with her sting attack on a creature at least once size category smaller than herself, she impales her opponent on her tail. While a xenomorph queen's opponent is impaled in this way, each time she starts his turn, she deals damage equal to her sting natural attack. As an immediate action, she can pull her weapon out of her opponent. A xenomorph queen's opponent can also spend a move action to pull itself off of her tail. When the tail comes out, a xenomorph queen's opponent takes damage as if starting his turn impaled. While a xenomorph queen impales her opponent with her tail, she cannot use it to attack. This fleshy creature is reminiscent of a crab without claws or shell, but given a wicked snaking tail. Implant (Ex) As a standard action, a xenomorph facehugger can lay an egg in a helpless creature no more than two size categories larger than it. A xenomorph's egg hatches in 24 hours, at which point the young xenomorph drone bursts from within the victim's chest as a full-round action, killing the victim (use the stats for a tiny viper with the xenomorph subtype to represent the fledgeling drone). The young xenomorph attempts to find a dark, secluded place to rapidly maturing into a fully-grown xenomorph drone within 6 hours. A remove disease spell (or similar effect) rids a victim of an implanted egg or active young. Otherwise, a character can attempt to kill the egg or young xenomorph by performing a Heal check (DC 20) and having the host drink an alkali flaskAPG. The implanted host takes 2d6 points of damage from the procedure and must succeed on a Fortitude save (DC 13). Success means the egg or larval xenomorph is expelled, failure indicates that the creature is still alive inside the host. Strangle (Ex) A creature that is grappled by a xenomorph facehugger cannot speak or cast spells with verbal components and automatically takes damage from the facehugger's strangle attack each round on the xenomorph's turn. Xenomorphs come in many variations, some greater than others. Below are some sample minor variants that can be applied to xenomorph drones. Acid Spray (Ex) A xenomorph drone can choose to spit acid as a standard action in a 10-foot line or 5-foot cone. Creatures in the area must succeed on a Reflex Save (DC 10 + 1/2 xenomorph HD + xenomorph Con modifier) or take 1d6 points of acid damage per 2 HD the xenomorph possesses. Xenomorphs that come from four-legged hosts have a less humanoid appearance. These xenomorphs lose their claw natural attacks, their speed increases by 10 feet (and Climb speed is now equal to land speed), and gain the Run feat as a bonus feat. Xenomorphs bred in areas of deep water gain the ability to swim quickly and breathe underwater. These xenomorphs gain the aquatic subtype and amphibious special quality. They lose their natural climb speed but gain a swim speed equal to twice their land speed. Great monster builds. I'll have borrow these nasty critters to spring on my players. As child of the 80's and 90's Aliens gave me countless nightmares that I can now inflict on my fellow gamers, thanks. Also I think it's an awesome to honor Mr. Giger, RPG style. Thanks for the kind words. If you spring these on your PCs let me know how it goes! Great idea and execution. I'm totally throwing a wave of these at my players tomorrow night! Thanks, Rob! I'm really glad to hear that these came out respectfully to the source material. Please let me know how they work out! Our group loved it! They were creeped out by the description, but when the queen got a second bite attack, they figured out what they were. Their fear of the acid blood was worse than the effect, though, haha. A great encounter, all in all. That's so awesome to hear! Thank you. He was an amazing artist. Are you willing to make an entry for the OGL Section 15 for use of this? Clearly the name is an issue (for someone other than you, as a fan-work), but the material is still decent, and worth considering for re-use.